Epson wearables launch with Moverio BT-200 smart glasses | What Hi-Fi? Epson is the latest company to get on board the smart wearables bandwagon, with the launch of two Pulsense activity monitors and a new set of Moverio smart glasses. 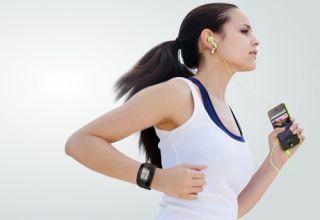 The Pulsense Band PS-100 and Pulsense Watch PS-500 are billed as "next-generation activity monitors", coming complete with heart-rate monitors and other apps and features that would usually require a smartphone. The PS-100 band is set to cost $130, while the PS-500 smart watch will be $200. Both are due on sale in summer 2014. If you don't fancy strapping something to your wrist, then the new Moverio BT-200 smart glasses, also launced at CES 2014, could be more up your street. Google Glass may have taken all the headlines, but Epson offered a Moverio augmented-reality set of specs some years ago – albeit in a far more basic format. The new Moverio BT-200 smart glasses deliver augmented reality across the whole display of the see-through lenses, rather than on a small display in the corner. They are also 60 per cent lighter and promise to look better and feel more comfortable. The Epson Moverio glasses use an Android OS, with Epson bringing developers on board to build app platforms for the glasses. One such early example allows users to see veins when wearing the glasses, clearly offering massive potential for doctors and nurses. Epson also gave slightly more trivial usage cases, albeit plenty of fun, such as delivering golf course information to players. The BT-200 can take information from pretty much any source and bring it in front of your eyes, from AR gaming to TV and films to browsing the web. An SD card slot allows you simply to connect and play content. Due out in March 2014, the Epson Moverio BT-200 smart glasses will cost $700, and are the only smart glasses to offer a dual lens, fully transparent display. Epson is best known in the UK market for its projectors where it's the world number one, but it clearly has the manufacturing clout to turn its hand to the very-hot-right-now wearables market.